First line: "The night Kate Harker decided to burn down the school chapel, she wasn't angry or drunk. She was desperate." I loved this fresh, inventive urban paranormal fantasy. 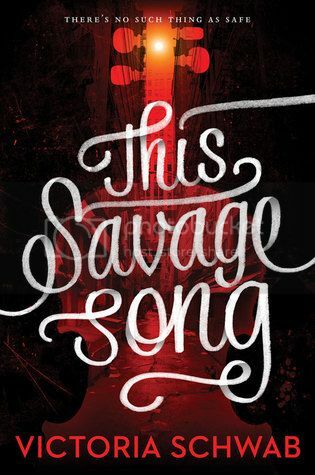 In Schwab's dystopian future, the world has come under attack from monsters of our own making - Corsai, Malchai and Sunai, each type springing up when humans commit violent acts. They are kind of like fey-folk, kind of like vampires, kind of totally their own thing. Super-rare, Sunai only burst into existence after mass murders. Corsai are quite vampire-like, and Malchai are simply ravening monsters that roam the countryside, keeping most humans penned into small fortress-like cities. Kate Harker is the daughter of a famed crime-boss who wants to prove her toughness to her father, more than anything. August Flynn is a Sunai who hates his hunger for human souls and struggles to reconcile his love of music with it's deadly effects. I liked his unconventional family; murderous Leo who gives in to his taste for killers and sweet Ilsa who models astonishing restraint each provide August with a completely different path that he might try to follow. August Flynn seemed like a smarter, more thoughtful Edward Cullen, that's for sure. There's the very lightest hint of romance, as August goes undercover at Kate's school, but nothing really develops on that front. Which makes perfect sense! With a city under siege and competing human crime syndicates, who has time to think about romance? Moody and atmospheric, perfect for Halloween, I'll recommend this to any teen readers who enjoy reading magical books about tortured souls.